Olympic 400 metre champion Kirani James, has received a cheque valued at EC 100,000 dollars, the first part of EC 500,000 dollars promised to him by the government after his historic feat in London last year. Prime Minister Dr. Keith Mitchell handed over the cheque as well as treasury bills to the tune of EC 400,000 dollars to James in a ceremony in St.George’s. 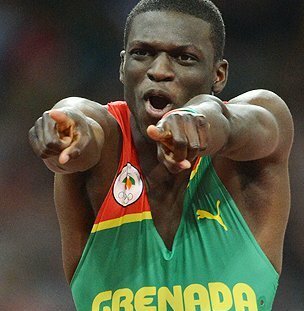 James was in Grenada for a weekend visit to family and friends after ending his 2013 athletic season. “On behalf of the government and people of this country, I want to present you with this EC$100,000 dollar cheque for what you have achieved so far and hope will be more successes in the future “, Dr Mitchell said. James is expected to receive EC 100,000 each year until the EC 400,000 balance on the treasury bills is exhausted. “Kirani we want you to know that at 19 years you attained heroic status- an icon of this country and nothing will change that,”the Grenadian leader told the country’s most celebrated athlete who sparked massive celebrations across this tri-island state and around the region when he became the first national to win an Olympic gold medal. “Going out there and performing to the best of my ability not only for me but for everyone in this country, has given him so much pride and upliftment; it is really unconditional”, Kirani said.